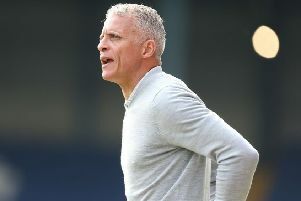 Dean Austin has admitted ‘only we can turn it round’ as he strives to find the reasons why the Cobblers have stuttered so badly at the start of the Sky Bet League Two season. The Town boss was hugely disappointed by his players’ performance in Tuesday night’s 1-0 defeat at Morecambe, which was the team’s fifth this season without a win in league and cup. Austin admits he is struggling to put his finger on what is currently going wrong, but knows his team has to ‘snap out of it really quickly’. The Cobblers manager questioned his players’ work ethic at the Globe Arena, admitting they were ‘out-thought’, and he knows there is a lot of soul searching for him and his players to go through if they are to turn things round ahead of Saturday’s trip to Colchester United. “We’ve got a very, very good squad of players and a very talented squad of players,” said Austin. “We had a good game on Saturday (against Cambridge United) but it was a tough game physically and it’s a quick turnaround and a very long journey (to Morecambe). “We have the talent and the pool of players to be able to make some changes and I felt that was the right thing to do. “Only we can turn it around. We need to regroup and get ourselves ready for a very tough game at Colchester on Saturday. “You can’t tell me that with this group of players we aren’t capable of winning games at this level. Social media was awash with disgruntled Cobblers fans on Tuesday night, while not many of the 230 who made the trip to the north west coast were impressed with what they saw, and Austin says he understands how they are feeling. “No one is more disappointed than me and I suffer more than anyone when the team not only doesn’t win, but when they don’t perform,” said the Cobblers boss. “I will be feeling the pain far more than anyone else, because I care.